I am always trying to find uses for empty containers in my home, like reusing empty milk jugs to store my homemade laundry detergent. I use Kelapo Coconut Oil in my home on a daily basis and I would typically just toss the jar but I thought about it and realized that I could reuse the Kelapo jar in so many ways! Use the jar as a hanging vase. You can cover the jar with a decorative piece of fabric and wrap some wire around the top of the jar and hang from your windowsill. Place the jar in your bathroom and store your Q-tips or cotton balls inside. Use the jar as a small flower pot. Pour some dirt in and plant your favorite spice or flower. Great size for placing on your kitchen window sill. 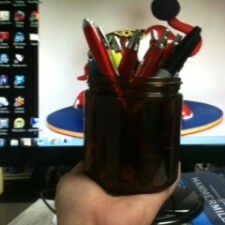 Use your jar as a pen or pencil holder at work! These were just a few of my ideas to reuse the Kelapo Coconut Jar. 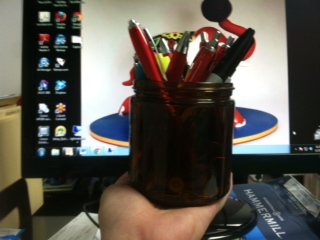 What are some of your favorite ways to reuse our jars? !